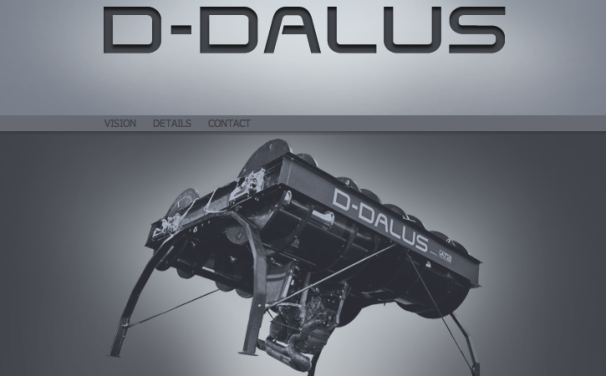 Screenshot of the D-Dalus website. The Austrian research company IAT21 presented a revolutionary new type of aircraft called the D-Dalus at the Paris Air Show. Unlike other aircraft, the D-Dalus does not use wings or rotors to achieve flight. It’s a rectangular sled that can takeoff using to four mechanically-linked contra-rotating cylindrical turbines. In English, this means that the D-Dalus uses the thrust from its four 2200-rpm turbines to push the aircraft up. If the aircraft begins to pitch or roll in any direction, it uses counter thrust to right itself. The D-Dalus is also extremely maneuverable because it can also direct thrust in any of the xyz axes in a 360-degree fashion. So it can take off and land vertically, hover perfectly, and move in any direction while doing so. Of course the vehicle would be impossible to fly by stick alone, so a pilot will be heavily assisted by computer algorithms to maintain balance. Much like another improbable flying aircraft like the B2 Stealth Bomber. IAT21 also claims that the aircraft needs little maintenance and will be cheaper than using current vertical-takeoff-and-liftoff aircraft with moving parts like the hover capable F35 Lightning II or the still used Harrier. The D-Dalus also has much smaller landing footprint compared to the large rotor-blade span of cargo helicopters like the Boeing CH-47 Chinook. Currently IAT21 is in a collaborative partnership with Cranfield University in the United Kingdom to push the D-Dalus through full flight certification. IAT21 is also working on upscaling the engine, the external hull shape, and the integration of next generation guidance and control systems. IAT21 plans to bring D-Dalus’ technology to search and rescue drones at sea and over land. In the longer term, the researchers hope to develop a passenger version for use in public transport networks.